Have You Ever Met an Unhappy Generous Person? Last year, Rachel created “save, spend, give” jars with the kids. And like most good Pinterest projects, we used them for a solid two weeks. But the motive remained – a desire to teach our kids a Biblical worldview of how to handle their money. As money came in from chores or gifts, she would help them figure out how much to put in each jar. The save and spend jars were the most tricky, because our kids had to decide the amounts and proportions. But the give jar was simple math. The Bible compels us to give 10% to our church. Got it. But what if the matter of giving isn’t just simple math? What if giving is much more complicated and subjective than the decisions we make about how to save or spend our money? 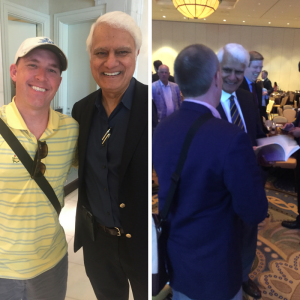 Meeting one of my favorite modern-day heroes of the faith, Ravi Zacharias. I even got brave and gave him a copy of Go Outside. He taught on how history should be seen as “His-story” lived out one person at a time. Preach! We are living in a consumer-crazed culture. After WWII, there was an increased workforce in America and a need to diminish the thrifty mentality of our grandparents and great-grandparents (aka The Greatest Generation). Think about it – back then if something broke they would fix it or just live without (GASP!). But with a changing economy, there was a deliberate effort to feed Americans a new storyline: buy, spend, acquire, by any means necessary. Fast forward to 2017 and we are swimming in stuff. We’re piling debt on our credit cards, maxing out our home loans, and Amazon Prime-ing cardboard boxes to our house like it’s our job. And we are constantly bombarded with ads that tell us we still don’t have enough. It’s never enough. If we are not careful, our hearts turn away from God to chase mammon. In the Sermon on the Mount, Jesus warns, “No one can serve to masters…you cannot serve both God and mammon.”What is mammon? Mammon refers to wealth, power, and influence. None of these things are inherently evil. Solomon had wealth. David had power. Moses had influence. God used each of them to impact history and write books of the Bible. Yet, they each had failings at times, arguably precipitated by excess power, wealth, and influence. Jump up several thousand years and not much has changed. Even the greatest lovers of God are often seduced by the quest of mammon. So how much is too much? The turning point comes when we stop using God-given blessings as a means to accomplish God’s will and we live our life with those blessings as the ultimate goal itself. Thanks, Jon Tyson, for an awesome message. Yes, I am talking to you (and me). I am going to pause here and bring these concepts a bit closer. Because if we’re honest, money is one topic that can make people close up quicker than a snowstorm in Alabama. If you are reading this post, it’s not an accident. Rachel and I sometimes fantasize about what it would be like to live in a third world country where we couldn’t be drawn away so easily by our comforts and indulgences. But here we are. In America. Wrestling every single day with our desire to own more and travel more and affect more. All of us, whether we have a lot or a little, seem to spend an inordinate amount of time dreaming and planning and deciding what we need. Whether it’s the excess – tickets to a concert, a farmhouse sink, designer clothing or the practical – college savings, healthy meals for our family, paper towels, we put great care into what we spend and save. God is more worried about what we give than what we save or spend. God straight up tells us not to worry about what we eat, drink or wear. He actually says that people who worry about those things have small faith. Ouch!However, he is very concerned about what we give. Which probably means we should be too. You may be wondering – if he has all of the resources in the world at his disposal, why does he need my money?Lean in close for this one.Every time we give, we say no to the spirit of mammon and yes to the Spirit of God. When we let go of money (give), we are loosening its grip on our lives. We are pretty much saying, “I trust you to care for me, God.” Not mammon. While those two interactions seem to contradict one another in some ways, they actually share the very same truth. The wealthy young ruler and Judas both valued their possessions over God. Mary valued Jesus over everything. When it comes to giving, God is most concerned with our motives. The deceitfulness of wealth chokes us and when you are choking, you lose all eternal perspective and all you care about is the now. But when we expose the lie of mammon and marinate in the fact that we have everything we need in Christ, we are free to experience true grace and joy. After all, have you ever met an unhappy generous person? I think what I like about Shelbyville is so many folks may be giving their money but just as important they give their time for others. I’m overwhelmed at times to see how many do so much for so many and it’s all out of the given and loving heart. So what if we all tithed our time. HummThanks Lee and Rachel. You were shaking my tree. After Two Years, This Is What Keeps Me Going. What Is Your Greatest Investment? Are You Serving Others, or Serving Success?